Amethyst Farm was started over a century ago by settlers who wanted to farm in the fertile valley that has become the progressive town of Amherst, Massachusetts. It has always been a family farm, changing hands over the generations, while maintaining the charming qualities of a rural homestead. The property has offered its residents the resources to establish a quality of life that produces self-sufficient results, with a horse-boarding business and an indoor equestrian arena that pays the bills, while an extensive acreage of hayfields lays the bedding to comfort both the two-legged and four-legged residents. This land has provided the good life to many generations of Amherst agriculturists. Now, a new generation of sustainable-minded farmers has moved into the old farmhouse, with goals of returning to a simpler way of living. Bernard Brennan and his wife and children moved to Amherst from Connecticut last year, with plans of revitalizing the old farm and making it produce more than just shelter for purebred show horses. The Brennans want to construct a local economy using Amethyst farm as a community center for the families of Amherst seeking more than the intellectual rigors of academia. Coming from Yale where he was a Professor of Behavioral Ecology, Bernard wants to put the horses to work and reclaim the land. 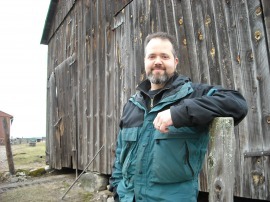 He sees this stretch of open pasture and small woodlot as an investment for his children’s generation, and his goal is to correct the incongruities caused by the elder generations whose cultural norms have led to peak oil concerns and social disparities that threaten future generations enjoyment of natural habitats. When he bought the 120 acre property, Bernard had never worked with horses before, although he did extensive research on the behavioral patterns of wasp species, that led him to appreciate the diverse mysteries of animals and their relationship with humans. When he came to Amethyst Farm, he decided that draft horses would be a key element to creating an alternative lifestyle that answered the problems of our dependence on fossil fuel. Horses have played a significant role in the founding of this country, and Bernard plans to reform this relationship with his own two hands on the reins. 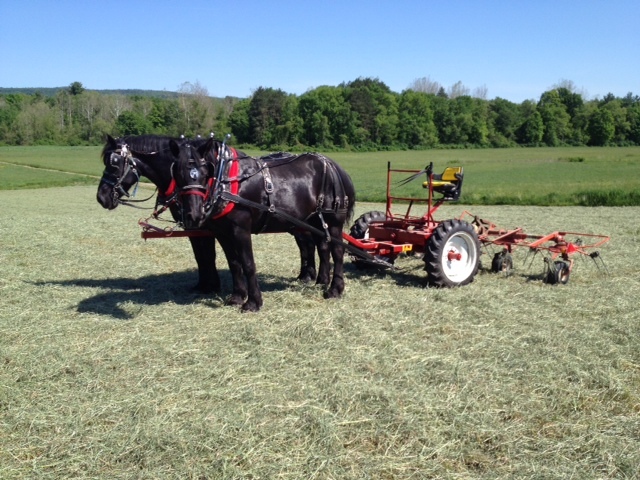 He bought two beautiful gray Percheron geldings which he harnessed up and hitched to a fleet of horsedrawn equipment that would otherwise be pulled by antique tractors. Pioneer welding is a company that produces modern farming implements for draft animal power, and Bernard has used his equipment budget wisely in purchasing quality-built equipment that will work the land without dependence on gasoline or diesel tractors. Last year, he plowed his garden beds with the team of Percherons and planted his family’s vegetable garden in that horse-tilled plot. Instead of planting the ordinary broccoli and carrots, he plans to grow crops that will feed his family in a holistic way. His first crop of rice was successful, and he plans to grow nut trees and shrubs along a one hundred foot long hedge row which will develop into a self-maintaining edible forest garden. This winter, Bernard plans to drive the horses into the twenty acre woodlot and harvest enough firewood to heat the old farmhouse, instead of filling the tank with expensive, imported oil. An important aspect of the Brennan’s farming enterprise is trading and bartering with their neighbors. They believe that modern citizens of the world have grown away from our neighbors, and that in order to create a healthier world, we must befriend the folks on the other side of the fence, and share the bounties of our harvest. Part of this mission has been the regular monthly potluck dinners that the Brennans have shared with other families and friends in Amherst. They share homemade bread, meats, vegetables, and skills with each other, in hopes of building longlasting relationships that will heal the wounds of our alienating society. Another huge philanthropic contribution that Bernard has made within his short residence in Amherst, has been the provision of land to the newly established Many Hands Farm Corps founded by Ryan Karb, Eric Day, and George Daniel Vest just this past year. All he asks from Many Hands is a share in their organic vegetable CSA and some help from their crew weeding the garden. 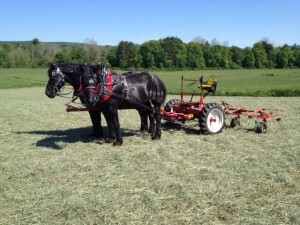 Bernard hopes to incorporate the Many Hands apprentice program into his draft horse operations within the next few seasons, by offering some training and hands-on experience with the draft horses. This would be a huge contribution to the farm corps that uses tractors on a minimal basis and depends on human labor as the primary source of energy in their growing of high quality fresh local produce. Bernard shares a philosophy with Blue Star Equiculture founders, Pamela Rickenbach and Paul Moshimer, who believe that this country was built by humans and horses together. Horses pulled the stoneboats that built the iconic stonewalls of New England. Horses pulled the wagons loaded with supplies and equipment that settlers used to establish new towns and societies. We owe horses as much respect and gratitude as our founding fathers and mothers. Without them, we would still be gardening in our backyards with our hands, and we would not even be able to refer to tractors and trucks in measures of horsepower. When I think of sustainable farming, I don’t think of John Deere and International Harvester. I think of sweating and backbreaking work, and plows pulled by stoic equines. Only when we as humans learn to appreciate our animal friends and take as much care of them as we take of ourselves, will we be on the right course to repairing the damage we’ve done to this world in the last one hundred years – and that’s a pretty short period of time, since we invented machines. Horses have been working with us for six thousand years. It’s time we remember that and follow in their hoof prints. I want to thank Bernard Brennan for showing me around his barnyard and stables, and for taking on the hard work of reestablishing the great occupation of horsemanship. One farmer and two horses can plow our fields back to the health of pre-European settlement. And I think that is a utopian future to work toward.